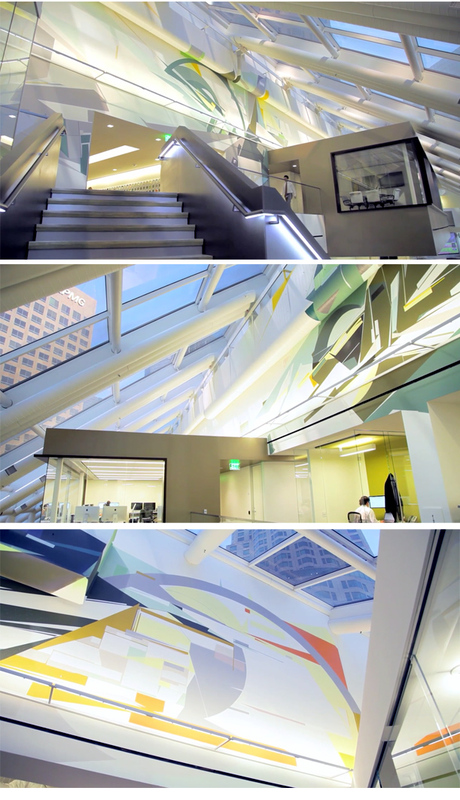 In the Spring of 2013 I was approached by CBRE & Gensler to create a mural for their newly acquired 400 South Hope office space. Though they purchased the entire building, the top 2 floors of the 26 story high rise would be home to their main Los Angeles Headquarters. After many meetings and litigations the project began in the mid summer during mid construction of the space. 2 weeks and some 20 gallons of acrylic later the mural was completed. This would mark my largest privately contracted indoor mural and a milestone in my public display catalogue. Many thanks FORM Follows FUNCTION for the documentation, Lew Horne, Nary La, Gensler and my 2 assistants Michael ‘Puede’ Hernandez & Ixchel Lara [complete credits here]. 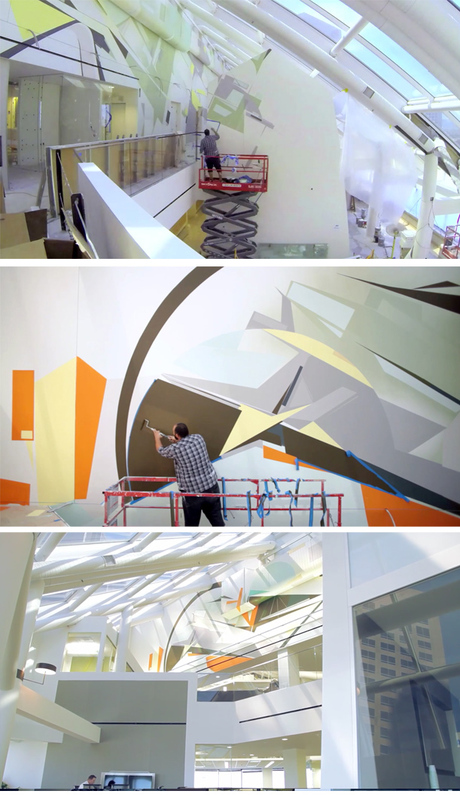 Against the backdrop of CBRE’s new space is a mural that symbolizes the company’s transition to a new way of working. It’s complex and thought-provoking, challenging the traditional muted colors and right angles of yesterday’s office. It redefines the 25th floor as something beyond a collection of workstations and conferences rooms. It’s a place we go to be inspired. Deeply rooted in its LA identity, the piece is a system of colors and angles that communicates an aura of renewal and progress. It’s a reflection of both CBRE and downtown LA, two entities in the midst of profound reinvention. Art and real estate services aren’t often mentioned in the same breath, but at 400 South Hope the two have combined to make something truly original. In seeking a complete overhaul to its traditional ways of working, CBRE found inspiration in Kofie’s work. And while he doesn’t always take on commercial projects, Kofie noticed something genuine in CBRE’s commitment to progress. It’s a complicated balance that is reminiscent of Kofie himself. Growing up in LA, he experimented with countless artistic media and tools. He can’t remember a time when he didn’t consider himself an artist. Kofie’s partially credits his mother for his inclinations; a former art student at UCLA, she held on to her passion while she raised a man who would eventually become world-renowned for his work. “I took over this career that my mom was originally supposed to do,” he said. Rather than photographs, the majority of Kofie’s childhood likenesses are captured in a sketch. His mother would often draw him as he slept. In contrast, Kofie’s father had more mechanical leanings combined with an entrepreneurial spirit. “My father was always independent,” Kofie said. “He never worked for anyone.” A talented artist who explores unorthodox media and exercises a keen sense of business, a combination of Scottish, Irish, German, African American and Choctaw Indian heritage, Kofie is a living narrative of the forces that combined to create him. Now, CBRE has a piece of that shared journey. The downtown LA mural is most appreciated in context, a celebration of an idea and the visionaries who brought it to life. It’s a story of progress, diversity, balance and the will to break with convention. + LA DT News: Does a New Downtown Office Design Mean the Death of the Cubicle?